Cheltenham: Edward Elgar, 2012, 351 pp, £90.00, ISBN 978-0-85793-098-9. Taking its title from the themes considered at the ITS’s Africa-Asia-Australasia Regional Conference, ‘Mobile Technology and Broadband Application Developments’ held in Perth, Western Australia in August 2009), this book asks: does regulation shape the performance of networks, and if so, how – and what might that tell us about designing policies in future? This overarching question leads one to some more fundamental issues: what do we mean by ‘performance’ in this context? What do we mean by ‘regulation’? Does it relate primarily to the decisions of regulatory institutions, or do we mean to track the effects of some wider sense of ‘policy’ development? And so on. What we talk about when we talk about ‘regulation’ can cover a very wide range and encompass a complex set of interventions into, and events influencing, industrial activity. Generally, most commentators understand these interventions to reflect the priorities and prerogatives of the state. These arrangements can be sector-specific or undertaken as antitrust enforcement; some of these are actions by Governments, operating either as a legislative or executive capacity; and other times via self-governance, technical standards or arrangements such as internet governance structures that resist categorisation as wholly public or wholly private. Often, ‘regulation’ implies a person or organisation tasked with a decision-making role. But there is also ‘regulation’ set in legislation (which has very different mechanisms of accountability from institutional decision-making) or where the role of decision-maker is distributed across institutions, acting at a sub-national level, nationally, regionally (eg the European Commission) or via multilateral or global arrangements (via the ITU or in the governance arrangements for the internet, for example). In practical terms, this makes comparison of different forms of ‘regulation’ difficult: the editorial approach reveals a tacit assumption that regulation has an underlying identity that unites a range of legal and economic interventions in markets. 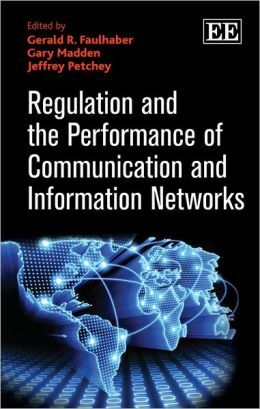 Looking at the themes considered by the different contributors, The regulation of spectrum, for example, often involves a licensing regime imposed via national legislation to give effect to internationally-agreed approaches to different frequency bands, aimed at managing scarcity and preventing co-ordination failures, whereas the ‘regulation’ of the internet is a mixture of practice, ‘policy’ (in the sense of ‘a way things are done’) and informal constraint, overlaid by attempts to use commercial law (e.g. intellectual property, contract and antitrust) to resolve issues as they arise. Does giving these systems a single name help or hinder efforts to understand them better? Similarly, defining a ‘communications and information network’ is surprisingly difficult. In the telecoms era (prior to, say, 2002), the concept of a telecommunications network was presumed to be stable and identifiable, and to remain so over time (it hardly makes sense to pass laws concerning the operation and maintenance of such networks, were it otherwise). And even if engineers, lawyers, economists and financial analysts had slightly different ideas about the nature of the network and its functional elements, they were all, at least, arguing over the precise definitional boundaries of their shared experience. In the digital era, virtualisation has shifted the boundary between hardware and software, and ever-more-versatile networks have shifted their commercially relevant functions into the application layer. Convergence between different transmission media has encouraged (and in some cases, demanded) side-by-side consideration of issues arising in the delivery of very different sorts of services or content (phone calls, broadband services and pay TV services, for example) , As a result, the conceptual distinctions between physical infrastructure networks, virtual (or logical) networks that emulate the features of physical networks, and software-mediated arrangements that are recognisable as networks in the economic sense but that do not presume any ancestor relationship with any physical network are harder to pin down – but does that mean we should ignore them and treat these ‘networks’ equivalently? (And that’s without even opening the complexity in the question of what constitutes ‘performance’). As a result of this complexity, there is a risk at times that this book could become disparate, with widely varying approaches failing to gel – but closer reading suggests that it avoids becoming incoherent or disjointed. To corral these issues, the editors have helpfully grouped the chapters into themes, each of which turns out to have an internal cohesiveness that adds to the value of the constituent contributions. The first theme relates to ‘Governance issues’. For regulatory governance to be effective demands that the institutions that design and set rules do so in a way that brings the right societal resources to bear, avoiding gaps in effectiveness, responsiveness or legitimacy. Exposing precisely this sort of gap in our thinking is the aim of Barbara Cherry’s paper, arguing that using economics as the sole legitimate basis for telecommunications policy has orphaned a separate strand of policy based on the obligations of carriers, with its basic features emerging from legal traditions relating to the professions stretching back to the Middle Ages. The result, she argues, was the need to develop the idea of ‘net neutrality’ to restore this missing function. Rob Frieden’s paper, too, argues that there are missing links in our thinking when we elide earlier concepts of ‘fair and reasonable’ pricing or non-discrimination, resulting when (in US parlance) new technologies for securing the de-regulated status as ‘information services’ rather than basic telecommunications (comparing cable and wireless). Rob Albon’s paper, describing the position across a number of OECD markets, is a useful addition to this work although it is perhaps a shame that his research was not developed further to explore implications, rather than simply documenting variations, of different policies in different territories. The overall message is that governance, and the way policy is framed, can shape regulatory outcomes and hence, have a wider impact on the regulatory system. The second theme achieves even more, by narrowing the focus on one particular measure, which is the extent of investment in communications networks – particularly fixed networks. Ingo Vogelsang’s paper explores the relationship between price regulation and investment, reviewing the literature to draw out the connection between regulatory commitment and levels of investment. (Communications regulators tend to be ambivalent about such commitment, given the rapid rate of technological change and the consequently high risk of being stuck with the ‘wrong’ policy. For example, the EU framework for electronic communications established in 2003 was revised in 2009 to require each national regulator to re-set rules every 3 years, limiting the ability of regulators to ‘commit’ to given levels of price regulation except through their general policies and approach). The paper also usefully flags the difficulty of incorporating innovation into this picture: it is a commonly held view that innovations should not be regulated, or regulated more lightly, in their infancy – but little agreement over how to recognise an innovation or when that status might no longer apply. Martin Cave’s paper considers the choices faced by fixed network incumbents weighing up a shift from copper networks to fibre (a process that in many developed markets has become entangled in political, as well as regulatory, debates). Operators build fibre when they feel they are likely to recover of that investment, and regulation that seeks to reduce commercial risk (driving investment) may undermine regulation promoting downstream competition. The logical extension of this thinking, as Harald Gruber notes in his paper on the European experience in balancing sector regulation and investment incentives, is that regulation of fixed (fibre) access networks emerges as more closely resembling the utilities models seen in energy and water markets than previously. The third theme draws together four papers dealing with services markets, and shifting from historical or deductive analysis into a more quantitative toolkit. It is here that the nebulous nature of the concept of the ‘network’ becomes more problematic. Nicholas Economides and Brian Viard’s paper, ‘Pricing of complements and network effects’, examines the relationship between a monopolist of a base good, and the provision of a complementary good provided by that monopolist or by another firm. Although this conceptual framework might be used to describe, for example, fixed or mobile access and the provision of calls over that network, the focus of the paper is, in fact, on the pricing of Microsoft’s operating system and software. By including this paper, the editors implicitly assert that one can straightforwardly apply methods and results across the boundaries between physical and logical ‘networks’. This is not an unreasonable proposition (although nor is it one beyond critical examination) but it is a gap that the reader is expected to navigate without assistance. Christiaan Hogendorn’s discussion of spillover effects explores the role of internet as a ‘general purpose technology’, which helps contextualise the arrival of the internet a vis-à-vis other previous waves of technology. This is also the concern of Gerald Faulhaber’s paper looking at the economic and social impact of mobile communications, which usefully documents the impact of mobile technology, with particular focus on the US, although marred a little by a lack of that wider context (the claim that mobile communications is ‘the single most ubiquitous technology the world has seen’ goes too far, I think). A particularly interesting contribution is the paper on network neutrality and sector performance by Kurt DeMaagd and Johannes Bauer, which uses a genetic programming model to examine the interdependencies and effects of policy rules in a complex system like the internet; the results in some cases reinforce prevailing wisdom (consumer utility increases with the number of platform providers) but in some cases suggest unexpected outcomes (for example, that telecoms networks profits might be lower if price differentiation is allowed). These are (as the authors emphasise) only signposts for further research, not firm conclusions, but important ones. The fourth theme relates to wireless communications. This is a less logical grouping, bringing together a survey of options for digital dividend spectrum licensing in Australia (by Benoit Freyens), and then two papers dealing with mobile call termination issues. Jerry Hausman’s paper on two-sided market analysis in the context of mobile call termination is characteristically intellectually robust, although the overall conclusion (we should not regulate mobile call termination prices at cost) is somewhat adrift of global policy trends. Reductions in termination rates in the EU as a result of the shift to incremental pricing have (at least in the UK, in this reviewer’s experience) been correlated with more vigorous competition between mobile operators (including, e.g. a shift to ‘all you can eat’ call bundles – long-seen in the US market, where termination prices have always been low or even zero). Edmond Baranes and Cuong Huong Vuong’s paper on asymmetry in termination rates argues for symmetry between mobile operators’ termination rates (which reflects European trends) but also symmetry as between fixed and mobile rates, an issue that remains one for the future, at least outside North America. A fifth ‘theme’, which is only one chapter but one worth reading: Shaun Greenstein’s paper setting out the paucity of evidence concerning the economic impact of IT in the US. As the paper notes, ‘there is no shortage of Internet policy debate, but there is a shortage of facts … I have observed this shortage in debates about: inequality of access and use of the Internet; effect of the Internet on global trade; changing requirements for human capital accumulation in information technology markets; and the spread of electronic government’. He makes the point that our understanding of, say, cement and concrete markets is immensely more nuanced and robustly-evidenced than our understanding of the central platform of the information age. That significant admission helps put into context all that has gone before: we are only just beginning to understand, and to document and analyse, the relationships between regulation and the performance of these various networks that constitute the defining technologies of our age. This book is a useful resource to those undertaking that work, both in its own right and because its assemblage is a metaphor for the wider challenge of marshalling that understanding across different areas of work, different sectors and across disciplines, territories and techniques.